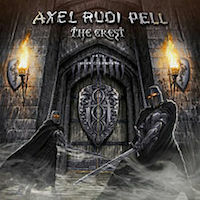 Another year, another CD from Germany born Blackmore wannabe Axel Rudi Pell. I happen to be one of those who really enjoys Pell’s brand of classic hard rock, even though he at many times copies Blackmore, both in playing and songwriting, that it borders to cloning. But now with his millionth CD or something even I start to think that he might have repeated himself a couple of times too many. To release the same album over and over again is never a good thing, unless you’re AC/DC and that is exactly what Axel Rudi Pell has done with this album. Again. But I remember when I discovered Pell. I heard the song “The Masquerade Ball” on a Swedish radio show and I was floored. It didn’t take long before I bought his compilation album The Wizard’s Chosen Few (2000) and realized that Pell had written a whole bunch of great songs which meant that I needed all those albums up until then. Sadly enough his first albums Wild Obsession (1989), Nasty Reputation (1991), Eternal Prisoner (1992) and Between The Walls (1994) weren’t all that great. Standard hard rock full of clichés and with songs that didn’t stand out one bit, despite a band full of good musicians and the voice of Jeff Scott Soto (Yngwie Malmsteen, Eyes, Talisman). Well, the debut had Rob Rock on vocals which didn’t really help. Black Moon Pyramid (1996) was the first Pell album that I considered really good – still with Soto – and then the great albums kept coming. But you can only repeat yourself for so long before it starts to get old and the fact that Pell has gotten away with it for many albums is that he has managed to write awesome songs which kind of makes it forgivable, but since Mystica in 2006, the whole stealing from yourself business has started to take its toll and his latest efforts has just felt like Pell and his band has released the same album over and over again. Not to be mean, but here we go again. The overall work here is impeccable and his musicians does a great job, especially singer Johnny Gioeli. Problem is, it gets old pretty fast. You feel like you have heard this album a 100 times, when it actually is the first time you hear it. However, there are some good stuff on here. ”Too Late” and ”Devil Zone” are great tracks. Heavy stuff that sounds like a more metal Rainbow, ”Prisoner Of Love” is catchy and commercial and sticks in your mind pretty quick and ”Glory Night” is a slow, long and heavy ballad, the way that Pell makes them. The album actually starts off well but gets dull after a while. Maybe the Pell die-hards likes his music this way, but I lose interest in his latest albums fast. Why bother buying a new Pell CD when his older efforts sounds exactly the same, only better? I hope he finds a way to reinvent himself or the risk is that he becomes a parody of himself, just like another guitar hero with big Blackmore influences, you know the Y guy. And just like the Y guy, I can’t for my life grasp why you – as a musician – want to do this. I mean, what about development, to move ahead, to reinvent yourself and not stagnate? Why not bring in a new voice to your projects, be it a song writing partner or a producer. It’s important to keep your identity but a whole other thing to just write the same songs over and over again. But in opposite of the Y guy, Pell doesn’t write crap songs or releases bad sounding albums that sounds like demo tapes. The songs here are ok, but they need to be so much more. Better luck next time.